Welcome back to our BricsCAD Journey. Our adventure continues with solid editing! BricsCAD offers many tools for editing solids. Today’s tour introduces you to some of the more traditional solid editing tools. Many of these may be familiar to you, especially if you come from an AutoCAD® environment. You’ll find the most common, and powerful, 3D editing tools on Model tab of the Quad. And, they’re all available from the Model menu. You can use the Union tool to combine multiple solid entities into a single entity. The image below shows the original 6 solid primitives on the left. On the right, a Union operation joined the boxes together. Two more union operations joined each set of wedges together, resulting in a total of 3 solid entities instead of 6. Depending on your design purpose, you can union all the solids together in a single operation. And, you can even union solids that are separated by space. The Subtract tool enables you to subtract solid entities from other solids. 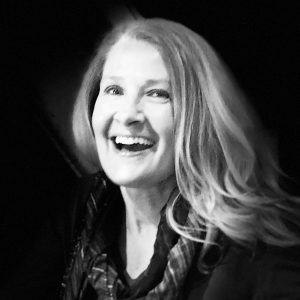 First you select the entities you want to subtract from, and then you select the entities you want to subtract from them. The second set of entities, the ones you want to subtract from the first set, are removed from the model. The Intersect tool creates a new solid at the intersection of the selected solids. You can select as many solids as you want but a new solid is only created if it intersects with all the selected solids. In the following image, if you select all three boxes, nothing is created. However, if you select only the two larger boxes, their intersecting solid is created. The original solids are removed from the model. The Interfere tool determines the interferences between two selection sets. Each of the two selection sets can include any number of solids. In the following image, the green solids are one selection set and the blue solids are the other. The red solids indicate the interferences between the two selection sets. The Interfere tool includes a Settings for you to the behavior and appearance for interferences. By default, it creates the interference solids on their own layer in red. 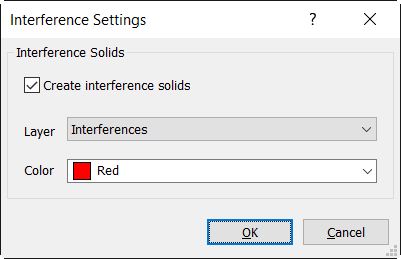 If you choose not to create interference solids, you have the option to zoom to each set of interferences within the model so you can visually inspect them. Use the Slice tool to cut solid entities at a specified plane. You can specify the plane using a variety of options. For example, you can pick a point to slice on the XY, YZ, or ZX planes, select a planar object, or pick three points to define a plane. An additional option allows you to slice the solid with a surface. This ability combines the freedom of surfaces with the power of solids. The SOLIDEDIT command is an older solid editing tool that offers many options. 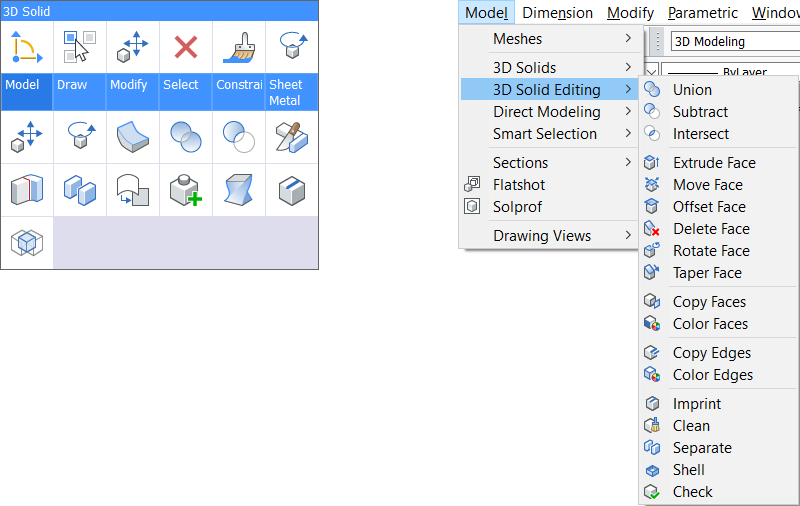 In fact, most of the tools on the 3D Solid Editing menu launch the SOLIDEDIT command with a particular option selected. 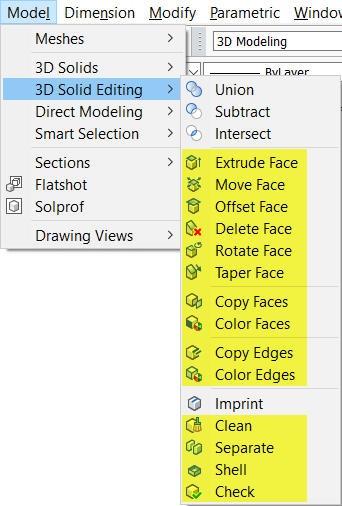 You can access most of the functionality offered by SOLIDEDIT in easier ways using direct modeling. So, I won’t cover all the options. Instead, I’ll focus on the two that I use most, Separate and Shell. 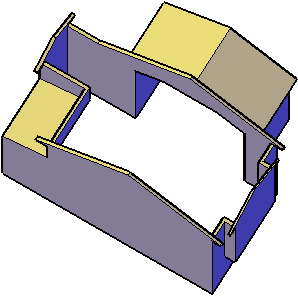 You can learn more about the other options in the Solidedit section of BricsCAD Online Help. Or, continue our BricsCAD Journey as we explore the more intuitive direct modeling options in future posts. The Separate tool, within the SOLIDEDIT command, allows you to separate a solid that has non-adjacent geometry into individual entities. The Shell tool, within the SOLIDEDIT command, allows you to create a shell from a selected solid. After selecting the solid, you have the option to select faces to remove and you must specify the shell thickness. The Shell tool was used on each of the solids in the following image. The solid on the left does not have any faces removed. From the outside, it appears to be solid all the way through. But, it’s hollow on the inside. The solid in the middle has the top face removed and the solid on the right has the top and front faces removed. The shell thickness is the same in all three solids. 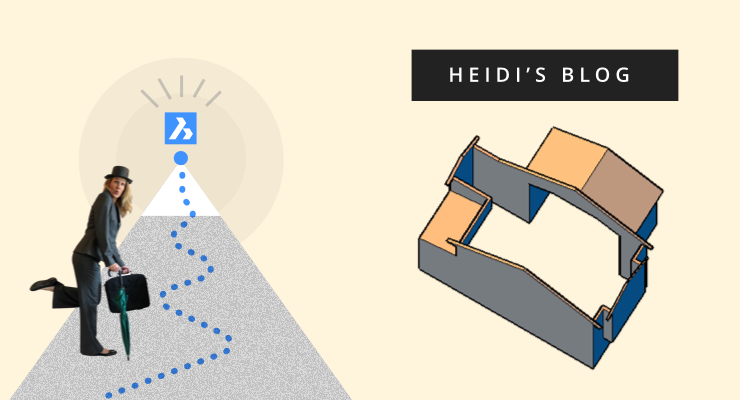 I hope you enjoyed this stop on our BricsCAD Journey as much as I did. I love modeling with solids. And, I love that all my years of modeling in AutoCAD transition so easily to BricsCAD. But, this is just the beginning. As I mentioned in a previous post, solids are a foundation for more powerful BricsCAD functionality including mechanical design, sheet metal, and, my favorite, Building Information Modeling. Regardless of what you’re designing, editing is key and BricsCAD offers powerful direct modeling functionality in addition to the more traditional 3D editing tools we explored here. So, the next stop on our BricsCAD Journey is all about direct modeling!